Alabama school administrators will now have the option of keeping a firearm on school grounds for dealing with an “armed intruder” incident if they meet certain qualifications after Gov. Kay Ivey signed a memo permitting the practice. Ivey’s May 30 memo will give all Alabama school administrators the option to keep a firearm on campus, provided they have a concealed carry permit, undergo training, are subject to random drug screenings, are sworn in as a deputy county sheriff, and work at a school without a school resource officer. “Unlike teachers, school administrators have complete access to their schools and are responsible for the safety of all students at the school, not an individual classroom,” the governor’s office said in a press release. Ivey said she signed the memo without waiting for a bill from the Legislature because “with the unfortunate continued occurrence of school violence across our country, we cannot afford to wait until the next legislative session.” The Alabama Legislature is out of session until early next year. “School officials have other jobs they are meant to be doing. They aren’t trained sharpshooters and don’t have ongoing training,” the anti-gun group said. But Amy Swearer, a legal policy analyst at The Heritage Foundation, took issue with the Moms Demand Action claim. “There are numerous examples of lives being saved because active school shooters were quickly confronted by armed personnel, including just this year at schools in Maryland and Indiana,” Swearer said. “Even in [Santa Fe, Texas], where 10 lives were tragically lost, the immediate response of armed school resource officers prevented the situation from becoming much worse. 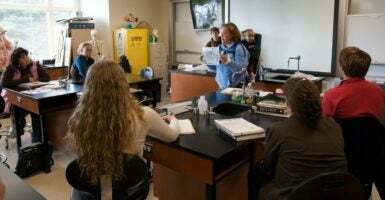 “Moms Demand Action may not consider these instances ‘evidence’ of how protecting our children with armed and competent adults increases school safety, but the students whose lives were saved might beg to differ,” she said.